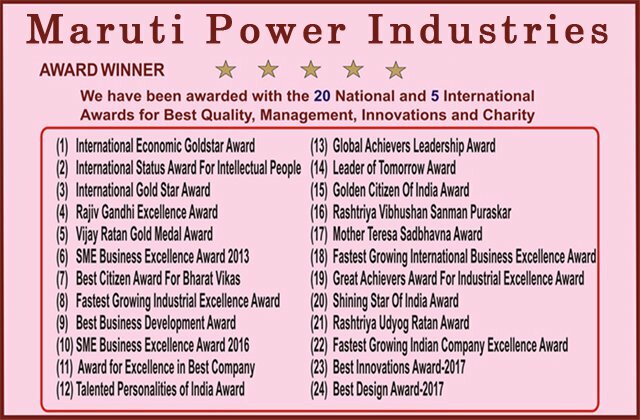 Maruti Power is a leading manufacturer in the hearts of Electrical hub Ahmadabad Gujarat India established in 1972 our principle is to provide best quality product at competitive prices to established long term business relation with our clients with recognised brand names. We believe in Electrical miracles on Electrodes. Our Products are, Load Break Switch, Air BreakSwitch, Isolator, Drop Out Fuse, Maintenance free Earthing Electrode, Earthing Material Discharging Rod, Operating Rod, Lighting Arrester, Cable Jointing Material, Overhead line material, Substation Equipment & Street light pole. We have and extensive electric products ranges like wise electrical generating sets of overhead transmission line-material like Insulators, Load Break Switch, Air Break Switch, GOAB Switch, Disconnecting Switch, Metering Cubicle Panel, HTMC Panel, Lighting Arrester, Isolator, Drop Out Fuse, Horn Gap Fuse, Discharging Rod, Operating Rod, Earthlings Electrode, Earthlings Material, Gel and Chemical Earthing, Earthing GI Strip and Plate, Copper Earthing Strip and Plate, Earthing Cover and CI Earthing Cover, GI Earthing Wire and Copper Earthing Wire, Cable Jointing Materials, High-tension Switchgear, Overhead, Line Materials, Sub-Station Equipment, ACSR Conductor, AAAC Conductor, Polymer Insulator, Porcelain Insulator, L.T. and H.T. Insulators, Silicon Insulator, Transformer and CTPT Street Light Pole, Shock Proof Equipments / Fire Safety Equipments, Aluminum Clamp & Connector, Aluminum Ladder, In Gujarat, India. As we serve international customers, it is mandatory for us to adopt international quality standards and practices. We introduce our-selves as a manufacturer of overhead transmission line-material like GANG OPERATED AIR BREAK SWITCH, DROPOUT FUSE HORN GAP FUSE AND OPERATING ROD for Dropout fuse. High Voltage Testing Set- Dry Power frequency high Voltage test up to 110 kv,Digital Coating Thickness Meter.